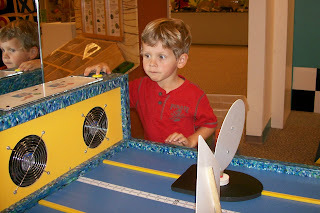 Dawson discovered a new exhibit at the children's museum, wind tables. 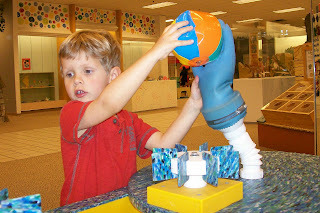 He was intrigued by the wind coming out of the pipes and had a great time exploring the different ways he could use the wind to manipulate various objects. 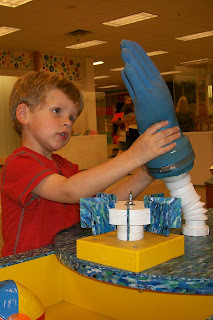 Putting the glove on the wind pipe and watching it fill up with air. 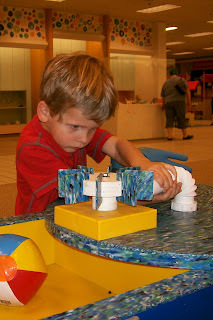 Pointing the wind pipe at the wheel to make it spin. 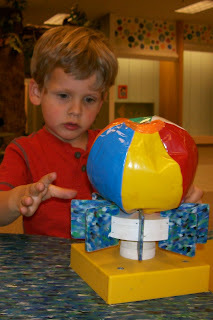 He especially liked placing the beach ball on the wheel, blowing the wheel with wind, and watching the beach ball go flying off. Making the glove toss the beach ball. Pushing the button to turn the fan on, which blew the sailboats all the way to the finish line.